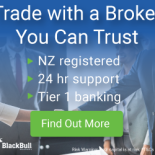 Trade with a Broker You Can Trust – BlackBull Markets Forex & CFDs Broker! BlackBull Markets was founded as an institutional broker, however now it also offers its services to retail traders. Based in Auckland, New Zealand, the brokerage also maintains an office in Kuala Lumpur, Malaysia. As well as Equinix trading facilities in London and New York.